Three years after what he describes as "the worst experience of his life", athlete Rhys Williams wants one last chance to represent his country. That would be at the Commonwealth Games at the Gold Coast next April. If he achieves this goal Williams, 33, will then hang up his spikes. Then, and maybe only then, Williams will be able to reflect more fondly on a period of time where he has fretted over money, suffered with stress and felt the need to temporarily move his life to the other side of the world. The Commonwealths would be a fitting end because of what happened to Williams when he missed Glasgow 2014. The former European 400m hurdles champion had to withdraw on the eve of the Games, along with 800m runner Gareth Warburton, after testing positive at a Grand Prix in Glasgow. The pair were cleared by UK Anti-Doping (UKAD) of knowingly cheating but Williams received a four-month ban, while Warburton was handed a six-month suspension after the pair took supplements they didn't know were contaminated. 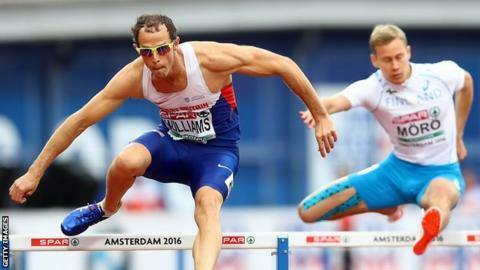 Williams has battled back and just failed to reach the Olympics last year after his selection credentials were ignored by British Athletics. Now he wants to complete his career in a Welsh vest. The Commonwealth Games is an event where Williams won a bronze medal in Delhi in 2010 behind fellow Welshman Dai Greene and he was supposed to be the athletics co-captain in Scotland three years ago before his withdrawal. "I would love to be in that Welsh team and finish my career on a happy note," Williams told BBC Wales' Beth Fisher in a special radio interview. "If I don't, then it's not meant to be but it won't be from a lack of trying. I am very proud to be Welsh. "It's been a long career and I have enjoyed it. There have been some been downs and some great ups. "I had a massive setback in 2014, the worst experience of my life. I believe in fate and things do happen for a reason. "I learned a lot, who you true friends are. "I am 33 now. I wanted to finish after that Commonwealth Games (in Glasgow) because I have other goals in life. "But what happened there has kept me going." Williams admitted the road back on track following the verdict to his case in 2015 has been fraught. The athlete admitted he had struggled with the financial implications of his legal case following the failed doping test which was helped to be funded by his father and former Welsh rugby player JJ Williams. Williams says the event had taken its toll on the family. "We went for a top QC and had a great result with a four-month suspension," said Williams. "Luckily my Dad was in a position to help me financially and he offered and decided to go down the route of getting a top QC. "You are left with a massive debt. It cost us all a fortune and you have to pay it. "I am lucky but there is bad feeling over the money side, not necessarily with the other stuff, between me and my Dad. "Money can sometimes cause a lot of headaches and it caused my Dad a lot of headaches. "Put yourself in his shoes. His son was getting married and he was very helpful with putting some money towards that. "He has worked hard for his money so why should he give it to me?" Following the verdict, Williams admitted he initially struggled to cope with the aftermath and relocated to Australia with wife Leila for a time. "I suffered from stress afterwards," admitted Williams. "I was a shell of myself. The sports psychologist referred me to a clinical psychologist so I tried to sort the problem out. "It was stressful for everyone who was associated with me. So we went to Australia to get away from it all, a change of scenery and get a bit of sun. "It worked. At the end of the year I was ranked second in the UK, finished fifth in the European Championships and only just missed out on the Olympics. "It was hard. But with hard work we managed to get ourselves out of this bad situation." Back on the track last year, Williams returned close to his best still had to cope with the disappointment of his Olympics omission last year which he unsuccessfully appealed. This was despite Williams, who reached the London 2012 semi-finals, running two Olympics qualification times and finishing fifth at the European Championships in Amsterdam. There was a spot available, with only Seb Rodger and Jack Green named in the event, but the selectors chose not to fill the third space despite Williams finishing third in the British Championships and Olympics Trials. Despite that setback Williams has his eyes on that one final flourish with Wales, as well as helping other athletes about checking their supplements. "It is very much a taboo subject but not to me," said Williams. "I am on the British Athletics anti-doping sub committee and I have given lots of talks. "I want to turn my experience as a positive for others so they don't have to go through what I went through."